Eugene Barton Evans was born in Holbrook, Arizona, on July 11, 1922. 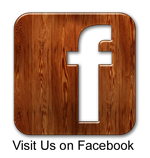 His family moved to Colton, California in 1930 where they ran a grocery store. Gene liked performing in stage plays while still in high school and upon graduation had earned a scholarship at the famous Pasadena Playhouse. He enlisted in the U.S. Army during World War II and there met director Sam Fuller, who would use him in many films during his career. He was injured in an overseas campaign and decorated, and also toured Europe with a theatrical company of G.I.s. When he was discharged from the Army, he joined the Penthouse Theatre group in Altadena, California. Between acting roles, he worked as a carpenter, dishwasher, bouncer and midget auto racer. He got to perform in his first motion picture in 1947—a western called “Under Colorado Skies” (as ‘Red’) for Republic Studios. 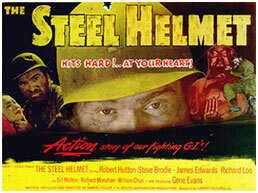 portrayal here of anti-hero Sergeant Zack in the 1951 Korean War film The Steel Helmet. The rugged-looking, burly character actor was to become a familiar face in many films and TV appearances for the next forty years. Gene starred or co-starred in over fifty feature films, including Larceny (1947) as ‘Horace,’ Storm Warning (1951) as a Ku Klux Klansman, The Steel Helmet (1951) as ‘Sgt. 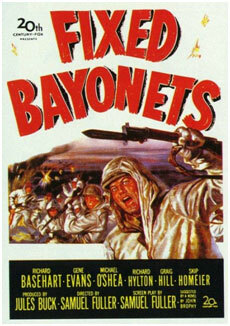 Zack,’ Fixed Bayonets (1951) as ‘Sgt. Rock,’ The Big Carnival (1951) as the deputy sheriff, Thunderbirds (1952) as ‘Mike Braggart,’ Donovan’s Brain (1953) as ‘Dr. Frank Schratt,’ Cattle Queen of Montana (1954) as ‘Tom McCord,’ Hell and High Water (1954) as ‘Chief Holter,’ Sad Sack (1957) starring Jerry Lewis, as ‘Sgt. Pulley,’ Operation Petticoat (1959) starring Cary Grant, as ‘Molumphrey,’ Nevada Smith (1966) as ‘Sam Sand,’ The War Wagon (1967) as ‘Hoag,’ Walking Tall (1973) as ‘Sheriff Al Thurman,’ and The Magic of Lassie (1978) as ‘Sheriff Andrews.’ He was considered a natural to play the strong father-figure in My Friend Flicka, and he worked long hours, six days a week, during filming of the series. He said that he enjoyed shooting and pitching horseshoes with co-star Frank Ferguson, who played ranch hand ‘Gus,’ whenever they got the chance. 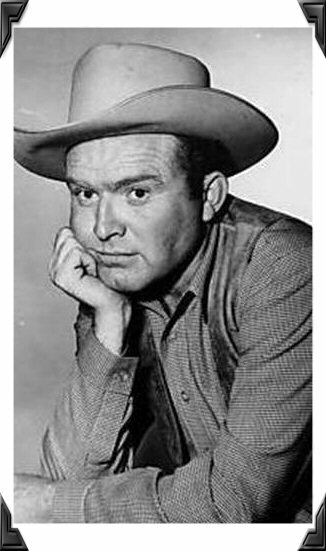 All in all, Gene Evans performed more than a hundred television roles—many in other popular western series like Wagon Train, The Virginian and Bonanza. He appeared in other shows as well, like The A-Team and Murder She Wrote. 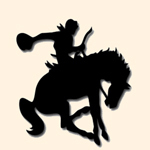 He was nominated for three Emmy Awards for performances on the long-running Gunsmoke TV series. He had regular roles on the Matt Helm TV series (1976-77) as ‘Sgt. Hanrahan,’ and another series called Spencer’s Pilots (1976) as ‘Spencer Parish.’ Always in high demand as an actor, especially for westerns, Gene appeared in several “made-for-TV movies,” including The Macahans (1976), The Shadow Riders (1982) and Once Upon a Texas Train (1988). In the 1990s, Gene finally retired to his farm at Medon, Tennessee, near Jackson. He enjoyed stock car racing, and remained a familiar face at western events like the Golden Boot Awards in Los Angeles and the Memphis Film Festival. Gene passed away in Madison County General Hospital, Jackson, Tennessee on Wednesday, April 1st, 1998 at the age of 75. Following is a wonderful article by British reporter Tom Vallance, which appeared in The Independent, a major newspaper in London, England,, on Monday, April 6, 1998, five days after Gene Evans’ passing. The British are well known for their genuine respect for accomplished American entertainers, while here in their home country they seem too frequently to be quickly forgotten once they exit the screen. Our hat is off to Mr. Vallance for the following tribute to a fine actor. “NOTED for tough and taciturn roles as outlaws or army sergeants, Gene Evans was a brawny, gruff-voiced character actor with a greater range than that usually exploited by the cinema screen and was a particular favourite of the writer-director Sam Fuller. It was in Fuller's masterly depiction of the early days of the newspaper business, Park Row (1952), that Evans had his finest role. In the Fifties he became popular on television, displaying in the series My Friend Flicka a jovial, warm disposition in contrast to the cigar-chomping tough-guy for which he was best known in Hollywood." "Born in Holbrook, Arizona in 1922, Evans went straight from high school into summer stock at the Penthouse Theatre in Altadena, California, then studied and worked at the Pasadena Playhouse prior to serving as a sergeant in the Second World War, winning five combat stars for his participation in the Normandy landings and other battles. When he returned to acting, his ambition focused on the stage because, he later stated, he had red hair. 'There weren't a lot of redheaded people working in pictures. The cinematographers had a hell of a lot to say about things, and they liked guys with dark hair, eyes and skin because they photographed better in black-and-white . . . But one night a guy came to the theatre and said, "I like your work and think I can get you work in pictures". I had a red beard and red hair, and Republic had just gone to Trucolor . . . they needed a guy for the part of Red in Under Colorado Skies (1947). It was a small part but I was paid $40 a day and I thought, where has this been all my life?'" "Evans stayed in Hollywood, working in a filling-station when roles were scarce. Tiny roles such as a sergeant in Tourneur's Berlin Express (1948) and a guard in Siodmak's Criss-Cross (1949) led to better opportunities, such as one of the strong-arm men who attempt to rob a sports-stadium in Fleischer's Armored Car Robbery (1950) and the deputy sheriff of the small Mexican town where a man's entrapment in an underground cave is exploited by a ruthless newspaper man in Billy Wilder's Ace in the Hole (1951). 'It was beautifully done,' said Evans, 'but did not do well because it turned people off.'" "When the producer Robert Lippert was casting The Steel Helmet (1951) for Sam Fuller, Evans referred him to Wilder who enthused about his ability. 'When Steel Helmet came out with me in the leading role, Wilder bumped into me at the studio and said, "You did it, you son of a gun - I knew you could or I never would have recommended you." 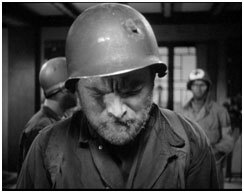 ' Set during the Korean War, the lauded low-budget film pictured war as primarily a fight for survival, with Evans convincingly portraying a cynical veteran of the Second World War leading a patrol behind enemy lines to capture one of the enemy for questioning." "He had a similar role in Fuller's Fixed Bayonets (1951), another Korean War tale (the battle was still raging at the time), similarly realistic and highly regarded. The following year Evans had his greatest personal film triumph in Fuller's paean to the newspaper business (in which the director had started his career), Park Row. Set at the turn of the century, during the birth of lino-typesetting, circulation wars, news-stands and more than one edition a day, the superb mixture of documentary and drama starred Evans as Phineus Mitchell, a composite of the great newspaper editors of the period, his idealistic journal locked in battle with the more sensational paper put out by his female rival. An underlying eroticism between the rivals ('You're fighting Mitch because you're excited by him,' his opponent is told by one of her colleagues) and Fuller's breathtaking use of tracking shots and deep focus (group shots consistently have Evans in close foreground) complement the compelling performances of Evans and co-star Mary Welch." "Donovan's Brain (1953), directed by Felix Feist ('He knew Sammy Fuller well and figured if I could work with Fuller I could work with anybody'), found Evans playing second-lead as the doctor who helps Lew Ayres keep a dead man's brain alive, and he was an outlaw plotting to steal a cattle empire from Barbara Stanwyck in Dwan's Cattle Queen of Montana (1954)." "'I never turned much down,' stated Evans recently, 'At first I was serious about my work, then it came to me that unless you were working for one of the big studios you weren't going to win awards or be taken too seriously.' Evans had the chance of a major studio contract when Fuller cast him in the submarine story Hell and High Water (1954) at 20th Century-Fox. The film starred Bella Darvi, protégé of the studio chief Darryl F. Zanuck, and the actress made no secret of her attraction to Evans during the shooting. 'When Zanuck found out, he cancelled the contract plans.'" "Evans continued to work steadily, including roles in Michael Curtiz's under-rated Twenties melodrama The Helen Morgan Story (1957, as a bootlegger pal of Paul Newman), R.G. Springsteen's superior prison picture Revolt in the Big House (1958, top-billed as a racketeer who becomes king of the convicts), Eugene Lourie's British-made horror The Giant Behemoth (1958, as a marine biologist hunting a rampaging paleosaurus), and his fifth and final film with Fuller, Shock Corridor (1963, as an asylum inmate, 'the most brilliant scientist alive' who becomes reduced to whining infantilism)." 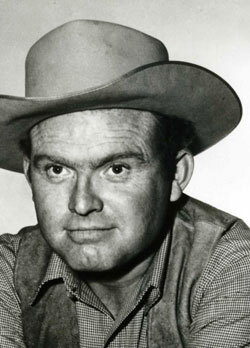 "Evans's television debut was in 1952, and he went on to make frequent guest appearances on such series as Gunsmoke and Rawhide, and in 1956- 57 he had the regular role of the father in My Friend Flicka, a hit series in which he was able to display a gentler persona than in most of his film roles. In 1973 he had his two last major big-screen credits, Pat Garrett and Billy the Kid and Walking Tall, though the following year he starred in a minor horror film, People Toys, because he was 'broke', a situation in which he frequently found himself because of his self-confessed 'playing around - partying, drinking, big cars, horse races . . . I played my whole role in Shock Corridor with a broken finger received in a fight in a pool-room and bar across from the studio.'" "In the mid-Seventies he had a log house built in 50 acres of woods in Tennessee and in 1990 sold his California home and moved there permanently with his family. 'I have fish in the lake and I have two boats and I can go out there and waste an entire day.' He recently compared his acting career to prize-fighting: 'I was never a movie star. A star's like the world champion, who fights once or twice a year because that's all he has to do. I was more like a club fighter, who had to fight at least once a month or he will starve to death.'" One of the nicest things Gene Evans did for Johnny Washbrook was this. At the end of the My friend Flicka series, Johnny Washbrook heard Gene Evans say that he had way to many scripts he had saved from various roles he had performed, and that he was going to throw a lot of them away as they were just taking up too much room in his home. Johnny decided that he didn't have use for all the ones he had been saving from him roles either, and that he should get rid of them as well. Gene knew that Johnny would appreciate having his scripts from his time with My Friend Flicka, though, and he got with Johnny's mother and borrowed all of the scripts. Gene had them all bound in nice embossed albums, and he presented them back to Johnny as a keepsake of their time together. "Eugene Barton Evans, actor: born Holbrook, Arizona 11 July 1922; married (one daughter); died Jackson, Tennessee 1 April 1998." Click here to visit the Internet Movie Database (IMDb) to review Gene Evans' Filmography data.